The new conservation Unit has been formally recognised by Brazil President Michel Temer in a presidential decree to create, in total, further 700,000 hectares of protected area in the country. 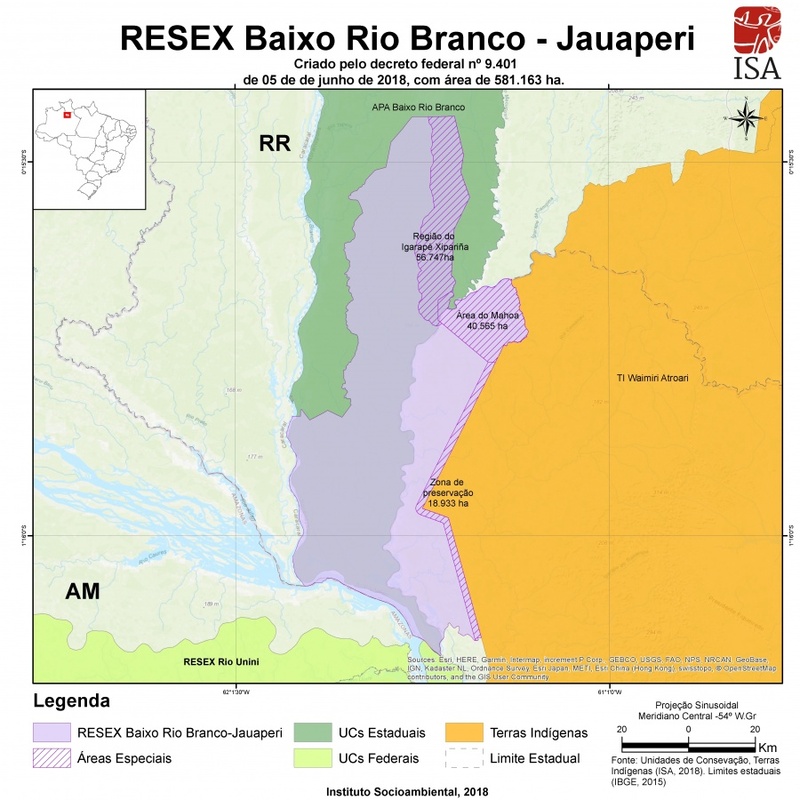 The Extractive Reserve (Resex) of the lower Rio Branco-Jauaperi between the Amazonians state of Amazonas and Roraima will benefit to the traditional population of the Amazon region. Since 2001, the inhabitants of the Rio Jauaperi in the Brazilian Amazon, circa 1000 native inhabitants formed by 9 communities along the Jauaperi river, have militated with the support of local and international NGO’s such as Amazonia Onlus, the Fundacao Vitoria Amazonica and the WWF Brazil for the creation of an extractive reserve to guarantee the long term sustainability of their forest. The Extractives Reserves (RESEX) are areas used by traditional extractive populations, whose subsistence is based on extraction and, additionally, in subsistence agriculture and in the raising of animals of small-stature. The basic objectives of the RESEX are to protect the means of life and culture of these populations, and ensuring the sustainable use of the natural resources of the unit. The extractive reserves are the result of historical conflict over land rights issues and are managed by the Institute Chico Mendes ICMBIO, named after the famous Amazonian activist Chico Mendes who lost his life in the defence of the rainforest. RESEXs are motivated by the fact that the local communities should play an active role in the management and control of the natural resources in the environment in which they live. In fact, native populations of the area of the lower Rio Branco-Jauaperi are at the origin and actively involved in conservation project thanks to the support of local and international cooperation. Local populations are engaged in the production of Brazilians nuts and natural fibres and in the conservation of the river and forest wildlife such as in the safeguard of river turtle. The community of Xixuaú, in partnership with the association Trentino Insieme and Amazonia Onlus, has also developed an eco-tourism structure with the construction of the Xixuau Amazon Ecolodge owned by local cooperative to offer sustainable income for more than 50 people in the region and welcome visitors and researchers from all over the world. Since 2009, the Amazon Charitable Trust, is pursuing this vision to train communities’ members and develop with the locals a first pilot project of Scientific Research Centre to benefit and involve all the native communities in the region. The Extractive Reserve is superb news for the people engaged in the fight for the conservation of the Amazon forest as it is a step further in the protection of the forest and its traditional inhabitants.